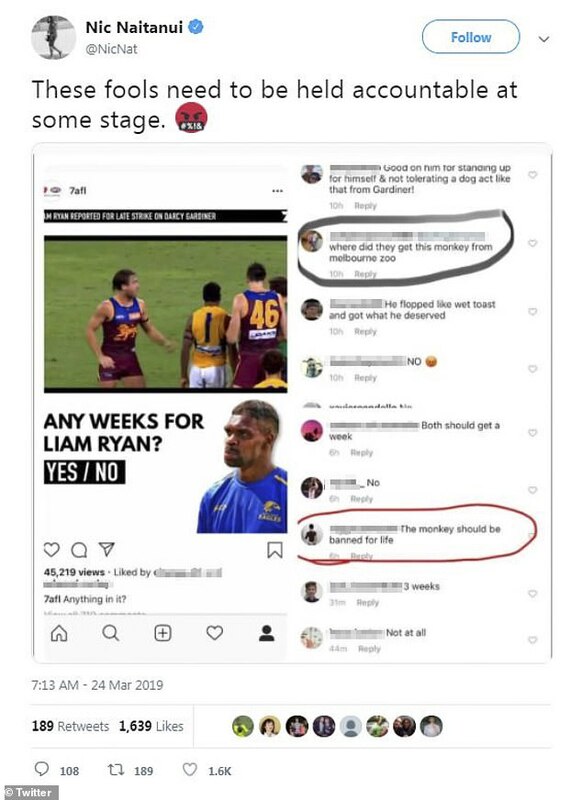 An indigenous AFL star has been targeted by racist trolls on another social media post by 7AFL. 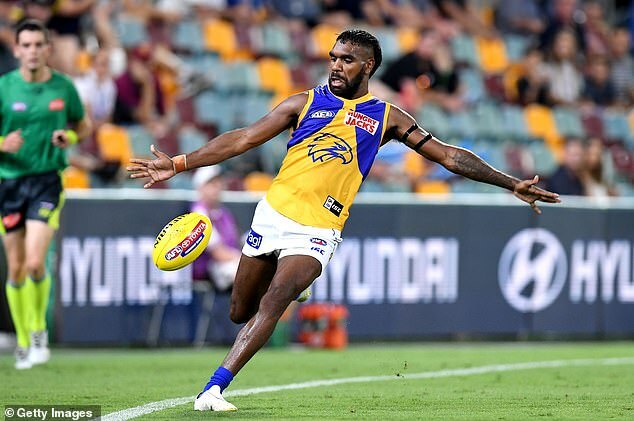 Channel 7 asked on its 7AFL Instagram account whether the West Coast Eagles player should be suspended after a late strike on Brisbane defender Darcy Gardiner in the Round 1 AFL match on Saturday at the Gabba. 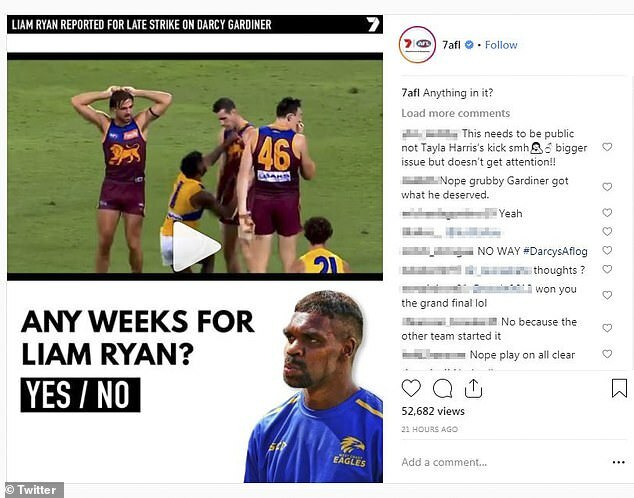 The network posted a video of the incident, and while the majority of comments by Instagram users were not racist, two commenters called the AFL player a ‘monkey’. 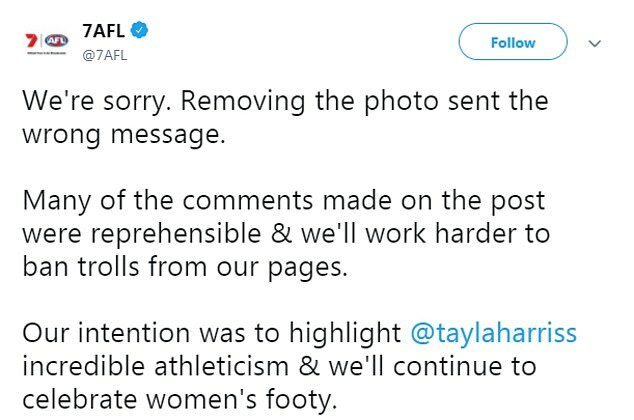 The controversy comes just days after a tweet by 7AFL which showed an image of women’s player Tayla Harris kicking a football was hijacked by fans who posted vile comments. ‘Where did they get this monkey from melbourne zoo,’ wrote one. ‘The monkey should be banned for life’ wrote another, who had a racist Instagram handle that included the N-word. Daily Mail Australia could not find either comment on the Instagram post on Monday. One of the accounts had been deleted, while the other account’s name was changed and set to private. 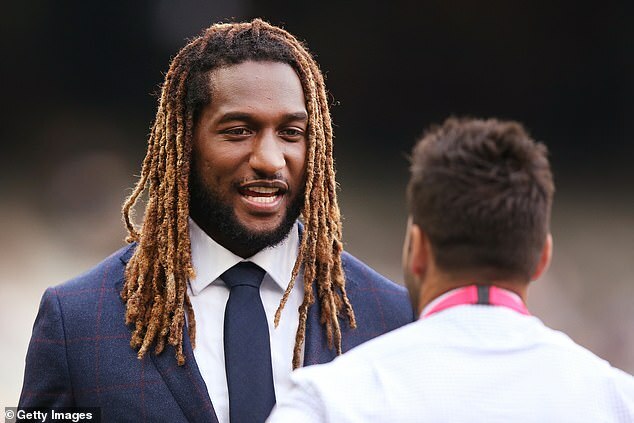 Scores of commenters immediately condemned the racist comments both on Instagram and on Twitter where AFL luminaries including Ryan’s team-mate Nic Naitanui rallied to condemn the prejudice. 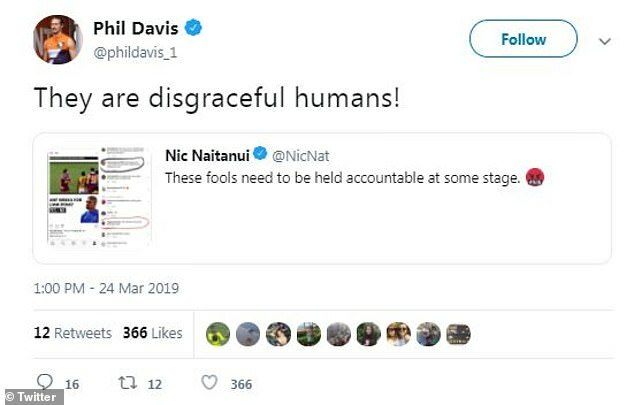 ‘These fools need to be held accountable at some stage,’ tweeted Naitanui as he called out the prejudice. 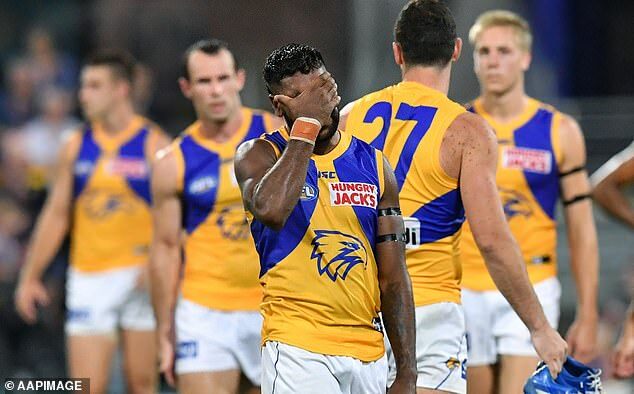 ‘They are disgraceful humans!’ tweeted Greater Western Sydney star Phil Davis in reply. Brisbane Lions player Mitch Robinson joined the chorus of condemnation, calling it ‘absolute bulls**t’ on Twitter and encouraging the AFL community to rally around Ryan the same way they defended women’s AFL player Tayla Harris. Harris was attacked with lewd and sexual comments on social media by internet trolls after Channel 7 posted a photograph of her in an athletic pose as she made a highflying kick. Channel 7 buckled and removed the photograph but later apologised and reinstated it, saying that removing the photo would send the wrong message. Instead it vowed to crack down on internet trolls. The network appears to have been as good as its word. Daily Mail Australia found no racist material in more than 700 comments on its Facebook post of the same incident. Its Twitter post was similarly clean. The AFL has tried hard to stamp racism out of the game after a number of scandals. In February this year the AFL threw its support behind Adelaide Crows star Eddie Betts who was also called a ‘monkey’ on social media. ‘When will it stop?’ Betts posted on Instagram along with a screenshot of the abuse. The AFL Players Association, the peak body for players, vowed to ‘name and shame’ the person behind the racist attack. Former Gold Coast midfielder Joel Wilkinson who is of Nigerian descent said he had been subjected to sustained racism over his career and last year said he would take legal action against the sport. Daily Mail Australia understands the case is still progressing through the Human Rights Commission. The AFL publicly apologised to former Sydney Swans star Adam Goodes in 2016 for not acting to protect him from abuse in his final season in 2015. The 2014 Australian of the Year and Brownlow medallist was repeatedly booed on the field after a controversy where he identified a 13-year-old Collingwood supporter who called him an ‘ape’ during a game. The girl was escorted from the grounds by security.